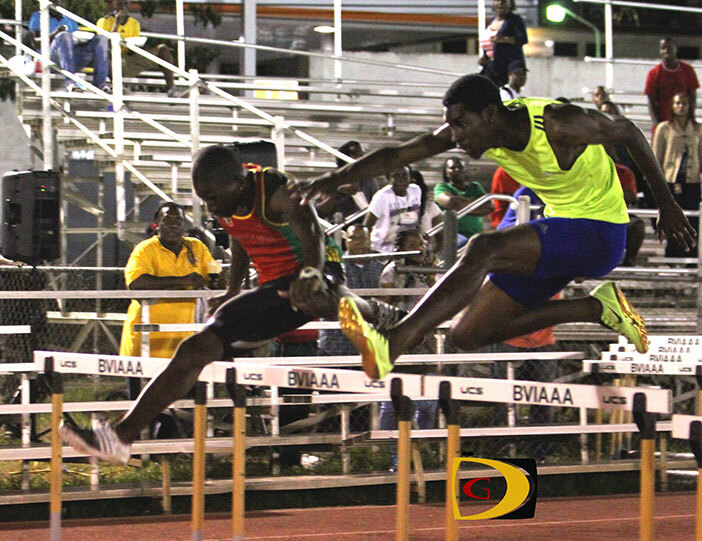 A thrilling 400m Intermediate Hurdles finish where 0.04 separated St. Kitts-Nevis’ Oneil Thomas and the BVI’s Kyron McMaster, brought the curtains down on the BVI Athletics Association’s 7th Development Series meet of the season, ahead of the March 13-14 Premier Dental National Jr. Championships. Under 20 Boys Thomas and McMaster, matched strides over the last 150m in a race that was a Carifta Games trials for the field, came off the final barrier almost in unison, drove for the line with Thomas getting the nod in 51.83 seconds to McMaster’s 51.87—both St. Kitts-Nevis and BVI National Jr. Records. 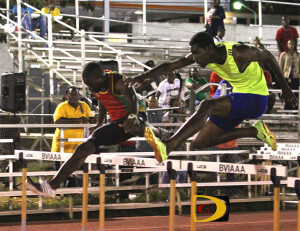 Oneil’s time also established a BVI All Comers Record and St. Kitts-Nevis National Record. Thomas chopped his best from last year’s 53.04 while McMaster sliced his from 53.26 also established in 2014. In the female 100m Hurdles, St. Kitts-Nevis’ Kesshonna Brookes sped to a personal best of 14.00 seconds in the U18 Girls discipline, while the BVI’s Deya Erickson—who moved to the U20 division this year—made her season’s debut in 14.38, the No 2 Jr. mark behind Arianna Forbes’ 14.27 National Jr. Record. Soon to be 14-year old Beyonce DeFreitas won the U18 Girls 200m with a personal best effort of 25.09 seconds into a -1.2 meters per second headwind. In the field, Akeem Bradshaw demolished William “Willie” Archer’s 28-years and a day old National Scholastic Long Jump mark of 7.11m (23’4”) from March 5, 1987, when he cut the sand at 7.25m (23’9½”) on his opening leap and bettered his previous best of 6.91m (22’8”). He had a 7.40m (24’3½”) foul on his second attempt before leaving the Long Jump pit and lined up in the 200m where he ran a personal best of 22.50 seconds behind Ronique Todman’s personal best of 22.45. In the USA, North Carolina’s Cary High School Sr. Lakeisha “Mimi” Warner made her 300m hurdles debut on Saturday, with a winning time of 47.9 seconds. Holmwood Technical High Sr. Jonel Lacey, competing at the Jamaica Carifta Games trials, missed the 400m Intermediate Hurdles final by a place with a time of 1:03.08, finishing fifth in her heat. At the 40th Montverde Eagle Invitational in Orlando, Fla, Montverde Academy self coached basketball Sr. player Tahj Malone, matched last week’s 1.93m (6’4’) personal best High Jump effort, to win the competition. Sophomore teammate Jude Kinkead was 4th in his 1600m heat in 5:36.24.